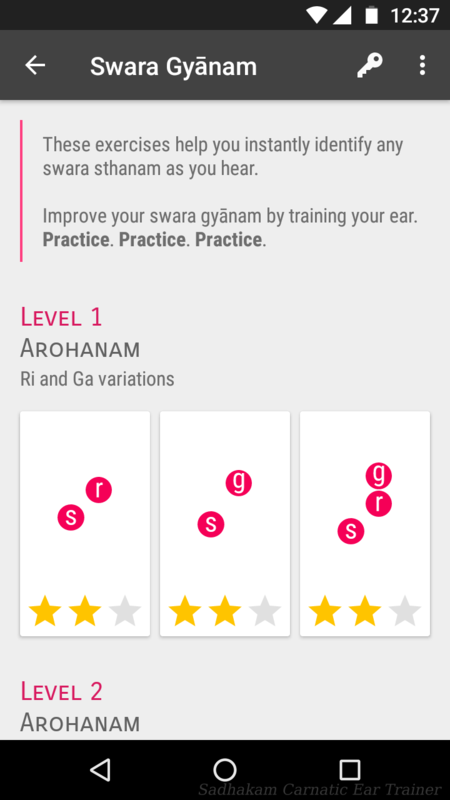 This article describes how the app works, various stages of swara gnanam development, and how to get the most out of it. The app's functionality is quite simple. It has many exercises. Each exercise focus on one aspect of learning. For instance, the first exercise makes you understand and distinguish the three swarasthanams of Ri. Exercises are interactive. The app plays a sequence, and you should identify one or more swarasthanams. You answer by choosing one of the choices. The app tells whether you are right or wrong and proceeds to the next challenge. This feels like a quiz game. Some users may feel it would be better if they can hear the swarams and combinations before taking the quiz. But the quiz itself is the learning process! Let’s say you start the first exercise and you are immediately asked to identify a Ri. 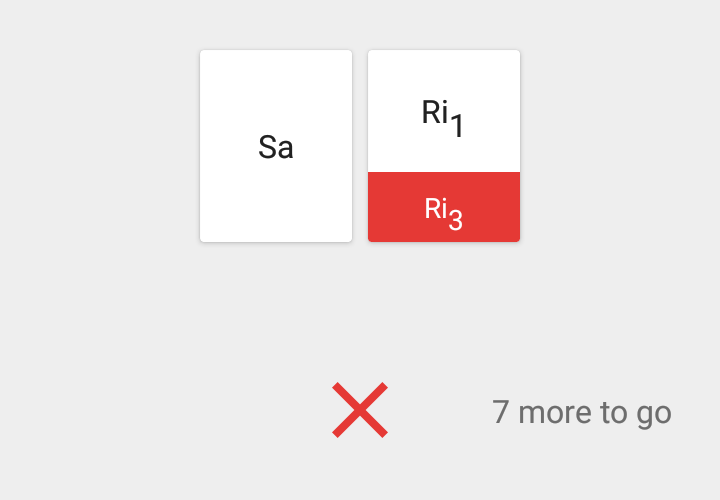 You have absolutely no clue whether it’s Ri1 or Ri2 or Ri3. You can replay the question again and again and listen carefully. Still doesn’t ring a bell? Just take a wild guess and answer. You may be right or wrong, but you shall make a note of the correct answer. Next time in the same session if you get the same combination you might get it right. Skill development happens in different stages when you practice this way. Initially, in an exercise session, you may make some mistakes but get many of the questions right based on learning from your mistakes. For instance, you answered Ri1 when the correct answer is Ri2. If the next question is actually Ri2 again you’ll get it. 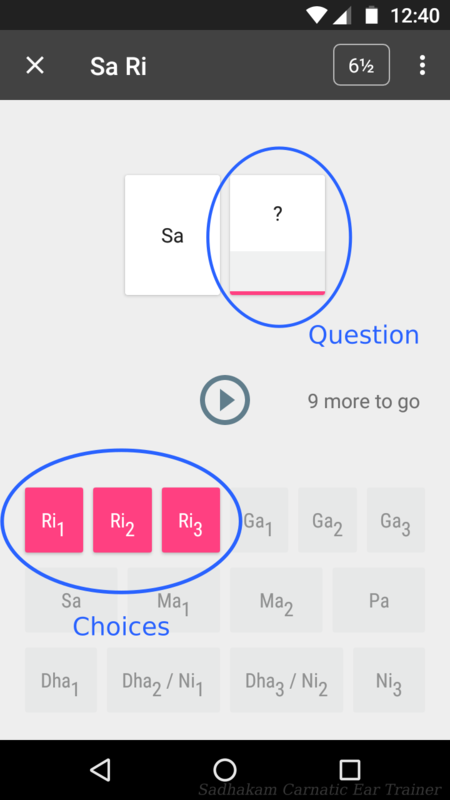 If the subsequent question is Ri1 or Ri3, you’ll compare the sound with the Ri2 in your memory and be able to make a reasonable guess based on whether the new swaram sounds higher or lower. This is the very first stage (let’s call it Stage 1). You make some blunders, based on that you learn something. But the learning in Stage 1 is very temporary. Let’s say you did reasonably well in an exercise in the morning. You were able to redo the exercise a few time in a row and get good scores repeatedly. But you try the same exercise in the evening and you do terribly, at least the first time. You redo the exercise a couple of times you are better again, as good as you were in the morning. Don’t loose heart, just keep practicing. 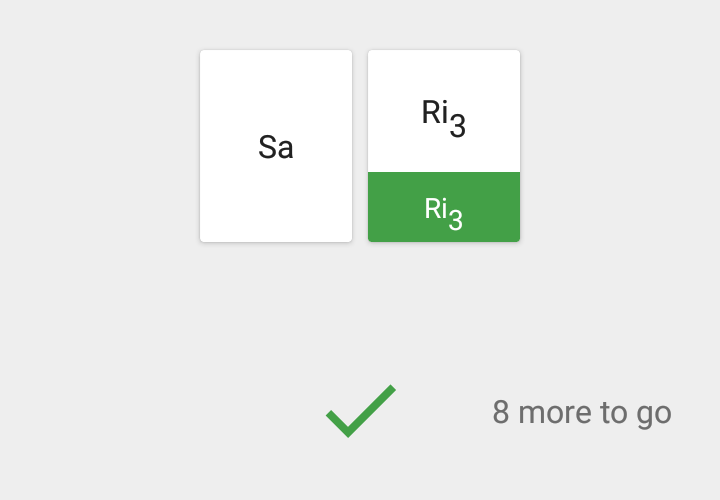 After a day or two you might get Ri1 correct any time but may have a little bit of confusion between Ri2 and Ri3. Let’s say this is Stage 2. If you have learned typewriting you’d have experienced the same stages. Initially you would be mindful of the keys, later you have some confusion between keys. But once you crossed these levels, you just type the words automatically. Our brains just need a lot of time and lots of repetition to internalize patterns. That’s why the exercises in Sadhakam app are short, reasonably fast paced and repeatable. So, don’t worry too much about making mistakes, just practice, practice and practice a lot!